Today millets are garnering the much-deserved attention across India because of their high nutritional value. States like Odisha, Telangana and Andhra Pradesh have launched special programmes to promote these Nutri cereals in the National Year of Millets. Millets are a diverse range of nutrient-rich crops. In the past 60 years, India’s agriculture policy has focused mainly on rice and wheat, neglecting millets. Supply of subsidised rice and wheat through the public distribution system and state nutrition programmes have also played a big role in changing the dietary habits of people. Besides, millet promotion is plagued by low produce, weak markets, difficult processing methods, and low consumer interest, even though many urban health-conscious individuals are now favouring them over the traditional paddy and wheat. In times of climate change, millets score over paddy as they require less water and can withstand extreme temperatures. Millets were always part of the traditional Naga diet, along with rice, in Chizami village of Phek district in Nagaland. Both these grains were manually pounded, which was a tedious job. However, with the arrival of rice mills, processing became easy for rice, but the drudgery associated with processing millets continued. Due to this, more preference went to rice and millet consumption greatly decreased, says Wekoweu Tsuhah, North East Network (NEN)-Nagaland director. But like elsewhere in India, millets have been revived here too, mostly the foxtail millet. With the intervention of NEN, many farmers are now reviving millet cultivation. The village council of Sumi in Phek district has decided to recognise and award the best millet grower in the community. The five-day millet festival, which for nearly three decades has not been celebrated, is once again gaining its place back in the community life of Chizami. In Chizami, millets are mainly nurtured by women and over the years they have realised their dietary and nutritional significance. This is the reason for their comeback in farmers’ fields. In Chizami, it is basically women, who are the custodians of seed diversity, including millets. They are involved right from the time of slashing the jhum (a type of shifting cultivation) fields until the final processes of harvesting and consumption. Seed selection, which is an important part of the process, is also mostly done by women. “With the help of NEN, farmers’ knowledge was strengthened. Gradually, women are beginning to sell millets besides consumption, thereby earning money. 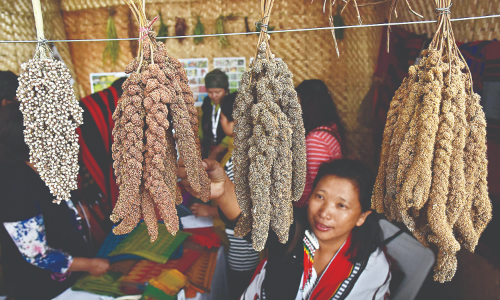 Market outlets for millets are still developing at the moment, and once properly channelised, they will definitely enhance the livelihood of women farmers,” says Stephen Gangmei, the in-charge of the millets project, NEN. Elsewhere too, there is a conscious effort to involve women in millets cultivation. In the Andhra millet mission, all kinds of efforts are being made by women self-help groups regarding the promotion of millets consumption in the rural areas. Recipe contests are also a part of this campaign, says Sanyasi Rao, programme manager with Wassan — a Hyderabad-based non-profit. Earlier, Rao told Down To Earth that small millets processing units are being established under the mission to help women. It is important to engage women in growing millets as they also gather uncultivated leafy greens while returning home from farms, thus supplementing the family’s nutrition needs, Rao adds. In what can be termed good news, millets across India have found favour among farmers due to their ability to withstand extreme heat drought. Browntop millet (Panicum ramosum) took a backseat with the introduction of groundnut in the villages of Tumkur, Karnataka about 30 years ago. Processing groundnuts were easy and the crop fetched better price compared to the millet. But with climate change, browntop millet became the ideal choice for farmers because it can resist both heat and drought requiring less water to grow. Being a drought-tolerant crop, brown top millet is the ideal choice now for some of India’s driest regions such as Chikkaballapur in Karnataka and Anantapur in Andhra Pradesh, says Krishna Prasad, the founder of Bengaluru-based non-profit Sahaja Samrudha. Pedda sama (little millet) has been revived in Vishakhapatnam in Andhra Pradesh over the past two years. According to Rao, earlier, farmers were growing it by exchanging seeds among themselves. During a village level seed festival, the farmers used to gather, open their seed pots, display their seeds and offer it to divinity. This is locally called the itukala pandaga festival. Before the Comprehensive Revival of Millets programme in Andhra Pradesh, this is how farmers were cultivating this millet in certain pockets. Under the revival project, campaigns were conducted at the village level to promote pedda sama, and as a result of this, the area under this crop has increased. The variety is now under study under the All India Coordinated Research Project on Small Millets. Two improved varieties were released. However, the improved ones failed and farmers prefer the traditional variety. Foxtail millet (Setaria italica) has been revived in Kurnool, Cuddapah and Anantapur districts in Andhra Pradesh. As a contingency measure, the agriculture department supplied foxtail millet seeds to farmers in 2016 when they lost the groundnut crop. Slowly, farmers picked it up and started storing its seeds as they got motivated. Now, it is a good income source for them. From Rs 20 a kg, foxtail millet rice has now touched about Rs 60 due to campaigns. In a bid to bring back millets to our fields and plates, some non-profits are making wholehearted efforts. In Mandla district of Madhya Pradesh, non-profit Action for Social Advancement (ASA) has identified around 30-40 villages for millets promotion through the procurement of appropriate processing units. ASA is also taking technical guidance from the Chennai-based non-profit MS Swaminathan Research Foundation on millet-based recipes. Currently, the Madhya Pradesh government is promoting kodo and kutki as part of the Centre’s Nutri cereal scheme to achieve nutritional security. However, Nirman volunteer Hiralal Sarote, who works in Silpidi village of the state, says though the state government talks of these two millets when it comes to promotion, we are trying to promote other millets like the sawa and sikiya among the tribals for better nutrition. Nirman, a Madhya Pradesh-based non-profit, mainly works with the Baiga tribals of Dindori district. Down To Earth found that in Mandla, the Gond tribals have developed a fondness for rice. Kanti Pandro of Dungariya village is habituated to eating eat rice every day. Same is the case with Budhia Bai, another farmer, in the village. In this way, millets disappeared from our plates as well as fields. But the good news is that farmers are bringing these nutri cereals back to our fields.